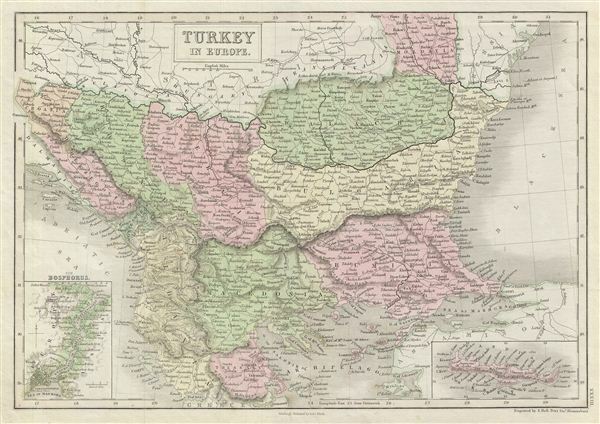 A fine example of Adam and Charles Black's 1851 map of the european parts of Turkey. Centered on the Aegean Sea, this map covers from Moldova to Thessaly and from the Adriatic to the Black Sea. This map, drawn when the Ottoman empire controlled much of the region, covers what is today Greece, Turkey, Macedonia, Albania, Bosnia, Serbia, Croatia, Bulgaria, Montenegro, and Moldova. An inset map in the lower left quadrant focuses the Bosporus and Istanbul (Constantinople). Another inset, in the lower right, details the island of Candia or Crete. Throughout, the map identifies various cities, towns, rivers, mountain passes and an assortment of additional topographical details. Map is hand colored in pink, green and yellow pastels to define boundaries. The map is engraved by S. Hall and issued as plate no. XXXIII in the 1851 edition of Black's General Atlas.